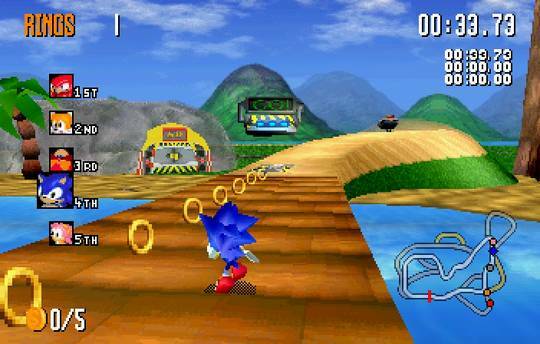 Sonic R is a racing game that was later ported to Windows PC in 1998. It consists of five courses, nine playable characters, as well as Grand Prix, 1P VS 2P and Time Attack modes. Each course features three laps and along the way you can collect temporary power-ups such as increased speed. Initial impressions are positive, with pumping euro-dance music that gets you in the mood for racing, and luscious graphics that do a terrific job of capturing the Sonic universe. However, once the racing starts there's a number of issues, namely the controls which (depending on your chosen character) are either overly sensitive when veering left or right, or incredibly stiff while turning; imagine trying to run in a straight line while drunk, or powersliding round a corner in a tank and you have a good idea how Sonic R controls. Sadly, even the level design is a mixed bag; some like Resort Island feature clearly signposted routes and obvious race lines that generally play okay. However, others like Regal Ruin are a mess due to its sharp 90° turns and corners that appear from nowhere; this usually results in you veering wildly off track, or getting stuck behind an object while opponents speed past. When you do successfully complete a Grand Prix course the feeling of relief overpowers any elation, and on top of this, the game always kicks you back to the main menu afterwards, breaking immersion in the competition! The multiple paths are a nice idea though and the ability to locate hidden gems and unlock playable characters is what gives the game some replayability. Yet, even that's limited, as with only five courses there's very little content to keep you coming back. Sonic R has some fantastic music and gorgeous graphics but Traveller's Tales messed up the controls so badly that it ruins pretty much the whole experience. The level design and anemic content could have used some extra development time too, and at the end of the day this racer doesn't hold a candle to Mario Kart (1997, N64). Random trivia: The PC version includes weather effects that were omitted in the Sega Saturn original.